The stories tended towards misty remembrances and “You should have been here yesteryear” yarns of island fishermen who told tales of streams in the San Juan Islands flush with glittering, jewel-like fish sporting bold, blood-red slashes below the jaw that endowed them with the piratical name of coastal cutthroat trout. Old-timers swore that these “cutts” once spawned in the small creeks that drained into the Salish Sea. And in recent years there have been tantalizing sightings by both fishermen and researchers. 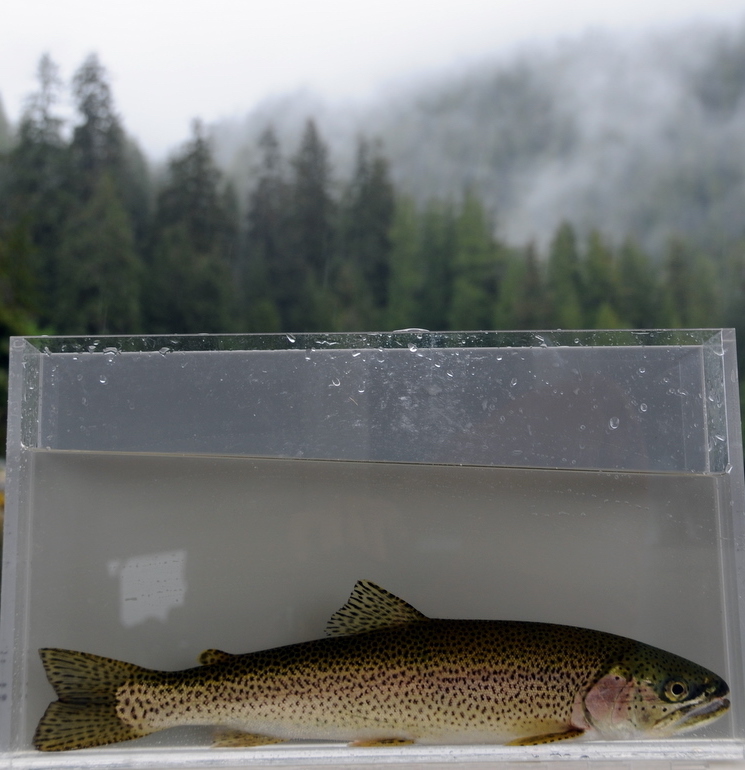 The chance that the islands hosted any self-sustaining populations of cutthroats was considered so small, however, that when the Washington State Department of Fish & Wildlife did their last statewide survey, they didn’t even bother sampling the San Juans. So SeaDoc funded a study to prove once and for all whether or not these fabled fish still exist. We worked with the Wild Fish Conservancy, Long Live the Kings, Kwiaht, and the WDFW Molecular Genetics Lab, and sent scientists armed with underwater cameras and “electrofishers” to several creeks on Orcas and San Juan Islands. The researchers pulled on their waders and sloshed from the sea to the streams’ fresh headwaters in search of hardy bands of cutthroats. Coastal Cutthroat Trout (Oncorhynchus clarki clarki) are the least studied of all the salmonoid species, overshadowed by the much larger and higher-profile Pacific salmon: Chinook, sockeye, coho, chum and pink. Cutts, similar to their better-known cousins, are anadromous—able to migrate from saltwater to fresh in order to reproduce—though some spend their entire lives in fresh water. Also like other Salish Sea salmon, coastal cutthroats are under intense pressure throughout their range from development, resource extraction, pollution from agriculture and stormwater runoff, and anything else that effects the riparian environment where they build their spawning nests, called redds, and where the newly born fish live the first parts of their lives. While the San Juan Islands are renowned for being one of the Salish Sea’s most pristine areas, even they are not immune to human impact. And coastal cutthroats are especially vulnerable in places like the islands where freshwater habitat is limited. So, as our scientists set out upstream, they couldn’t be sure what they’d find. There are, of course, other fish living in the island creeks, so shadows flitting across the streambeds could have been anything. It wasn’t until we saw the underwater footage and collected DNA from fish we photographed, measured, and then gently released that the results were clear: at least three streams on Orcas and San Juan Islands do indeed have successfully breeding resident populations of coastal cutthroat trout! 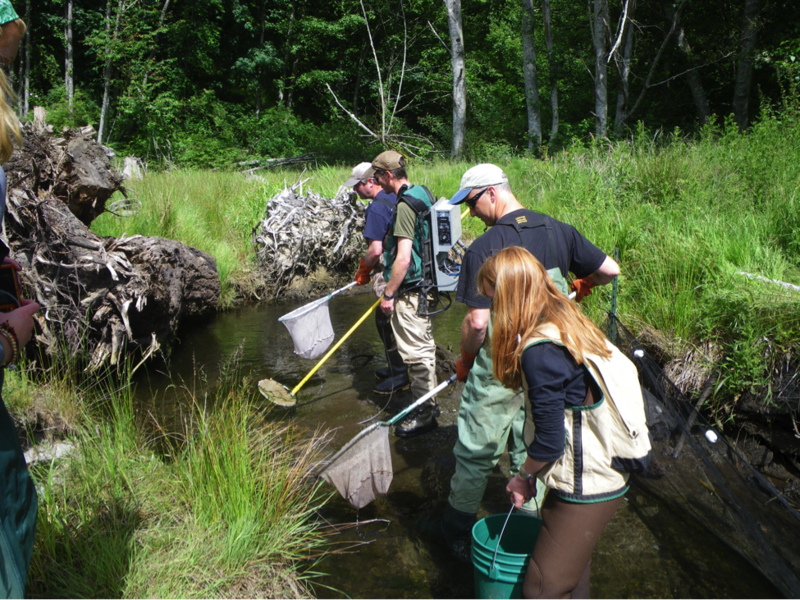 Even more exciting is that two of the streams studied are home to fish endemic to the islands, including one fascinating cutthroat community in Orcas Island’s Doe Bay Creek that has the lowest genetic diversity of any cutthroat population ever tested in Washington State. These beautifully speckled little fish may have been isolated and sustaining themselves in this very limited and unpredictable environment for more than 4,000 years. Talk about hardy! Garrison Creek on San Juan Island also has a surviving stock of natives despite water diversions, culverts, and livestock crossings that have fragmented the watershed and restricted stream flows. Searching Cascade Creek on Orcas revealed more resident fish, but they proved to be genetically influenced by the mainland hatchery cutthroats regularly released into Mountain Lake..
Finding these fish, in particular the remarkable natives that have held out for so long, was both thrilling and a great example of successful field work. The troubling part was that we didn’t find many of them. Each cutthroat stock we found consists of only about 25 breeding fish. Already constrained to thin slices of suitable habitat, these scant populations are vulnerable to any number of random events that could potentially kill off the entire stock. The flip side is that since they have survived in such a confined environment, the opportunities to restore their habitat and rebuild their numbers are relatively clear-cut. The study’s authors put forward a set of common-sense conservation ideas, and SeaDoc will be staying involved and working to study and preserve these hardy bands of island cutthroats that live in our own backyard. Read the entire report here, and as always it’s thanks to your support that we’re able to continue our work to heal the Salish Sea.